Understanding which pumps are the most suitable for irrigating fields or market gardens. All the farmers irrigate their crops when they can access sufficient quantities of water. The farmers most concerned are those living in arid or semi-arid areas, where precipitations are low and irregular. Irrigation is a means of increasing crop yields. But it is very complicated or inefficient without a pump. It is therefore important to know which type of pump to choose to irrigate. Large and small farmers as well as individuals who cultivate a vegetable plot. This sheet also gives an overview of miscellaneous types of pump recommended according to the surface areas to be irrigated. 5) Which pumps for which crops ? There are several types of hand pump based on the hydraulic drive used (rotor, membrane, suction, pressure) and the control component (hand or single or double treadle). The main advantage of human-operated pumps is that they are one of the most economical and simple solutions to providing a collective drinking water supply of in rural areas and in near-urban environments. The main drawback is the maintenance required and the not insignificant physical effort for the pumping. This process basically involves farmers requiring a great deal of water and who have camels, cattle or donkeys in arid countries. It is used to extract the water from wells where the water is frequently not suitable for human consumption. Motor-driven pumps pump the water at a chosen flow rate, more or less fast, constantly or otherwise. These pumps are operated by petrol, diesel or electricity. It is therefore advisable that these resources are easily and quickly available to avoid running out of fuel. They are more expensive but more practical than the previous and the subsequent pumps. These pumps convert the kinetic energy of the wind into mechanical energy. Their operation is admittedly less reliable than electricity but large volumes of water can be pumped thanks to an energy that is free. These pumps are a competitive solution for pumping compared with motor-driven pumps in areas where the wind blows on average at 15 km/h. This is normally true of areas with few trees (savannah grasslands, semi-desert or desert areas). 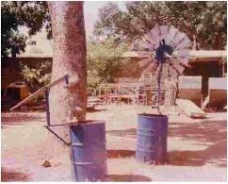 Above, a wind pump for a well in Mali ; it has an output of 1930 l/h with wind at 4 m/s and a depth of 12 metres. The main advantages of this technology are the low maintenance costs (normally limited to cleaning the pump itself) and the fact that no outside fuel is required (oil, electricity). It does on the other hand require substantial investment and there is a high risk of theft. This technology is suitable for areas with abundant sunshine (more than five hours a day). This process is based on a phenomenon that can easily be seen in our own water pipes and which is called "water hammer". The main strong points of hydraulic ram pumps is their low maintenance and the lack of costs due to the presence of a motor, as the energy operating the ram is provided by falling water or a change in its level. Comments : Rope pumps can be classed as hand pumps, motor-driven pumps or animal-driven pumps depending on the type of energy used. The name "rope pump" in facts relates to the control method used. These gardens require reliable, regular water input in the early morning and in the evening. These constraints can make it difficult to use solar pumps, which also represent too much investment for a single individual. The wind pumps can be adapted if the wind blow regularly in the area, otherwise the water input will not be guaranteed. The hydraulic ram pumps produce a substantial flow of water during the day but at a slow rate. If the pump is coupled with a reservoir, this has the time to fill up at night and during the day. 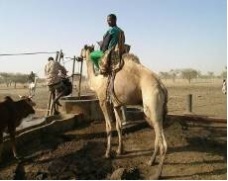 Animal-driven pumps can draw large volumes of water but if the pump only has to supply water to irrigate a small market garden, the cost of maintaining the animal and the well will not pay for itself. Globally, pumping systems using fuel are always more expensive and human-operated pumps. Their main advantage is to supply simply and at any time pressurised water that can be used for sprinkling or drip watering. Hand and treadle pumps are therefore the most suitable for a small market garden. On the other hand, sprinkling or drip watering is impossible with this type of pump, also gravity-fed irrigation can be envisaged. The choice will thus depend on the amount of water available (the drip system is very economical with water) and the quality of water sought (water pumped with a hand pump is more protected during pumping that water pumped using a double treadle). 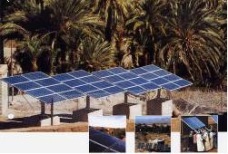 It is always difficult to plan for the use of solar pumps as the water requirements will be huge and a substantial reservoir will therefore be required. In addition, after the evening watering the reservoir will not fill up during the night for the morning watering, except with a solar pump fitted with batteries (additional cost). Like solar pumps, wind pumps also have the problem of the size of the reservoir and the reliability of the resource. There must be enough wind night and day for the reservoir to be full when watering occurs. Hydraulic ram pumps seem ideal coupled with a large reservoir, but they can only operate in an area with a waterfall or a body or water or a river with huge level changes. Animal-driven pumps can be envisage for a gravity-fed irrigation but not for sprinkling or drip irrigation. Human-operated pumps are also adapted to such surfaces, however care must be taken to monitor the wear of the pump given the tremendous use expected of it. These pumps require huge physical effort but are much cheaper than fuel pumps. Treadle pumps are the most suitable and are cheaper than hand pumps to draw large volumes of water. Motor-driven pumps are very suitable for this type of crop and can be used for sprinkling and drip irrigation, but they are more expensive than the human-operated pumps. Solar pumps are not really an option for such extensive crops. The use of large agricultural wind pumps could be envisaged but they are fairly expensive to buy. As for using home-made wind pumps, they are not suitable for the volumes of water needing to be pumped and the required reliability. As the ram pumps can only be used in areas with huge level changes, it is highly likely that cultivation of this size cannot be achieved. Animal-driven pumps are suitable for this type of cultivation if the planned watering system is gravity fed. Human-operated pumps are not suitable for this type of cultivation as the volumes necessary are too high in terms of the physical effort and pumping capacity of the pump. Lastly, motor-driven pumps are best suited for the irrigation of extensive crops. As the costs of each solution depend on the pump chosen, we refer the reader to the sheets indicated previously. - US AID. "Study on the development of irrigation system models intended to serve in the "slums" and floodplains of Guinea".